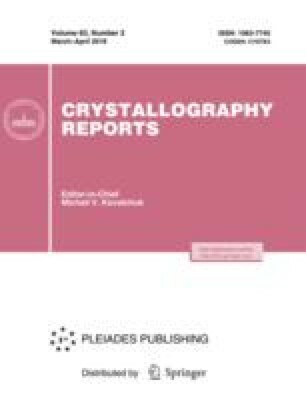 Optical inhomogeneities of calcium molybdate crystals in the initial state and after isothermal annealings have been investigated. The value of anomalous birefringence of the samples has been estimated by Mallard’s method; it is shown that annealing reduces this value. Scattering centers have been observed by the Tyndall method. Microscopy has revealed inclusions 2–10 μm in size in all samples. They can’t be attributed to the crucible material inclusions. Light-scattering indicatrices are plotted based on scattering spectroscopy data. Sizes of the scattering centers are estimated. Original Russian Text © N.S. Kozlova, O.A. Buzanov, A.P. Kozlova, E.V. Zabelina, Zh.A. Goreeva, I.S. Didenko, V.M. Kasimova, A.G. Chernykh, 2018, published in Kristallografiya, 2018, Vol. 63, No. 2, pp. 234–240.